The large wrist Edie bangle is handmade in the UK and exclusive to Guilty, a perfect choice if you want a solid sterling silver bangle with a hammered exterior, perfect for wearing at any time with an exquisite finish! The Edie large wrist bangle is a new addition to our growing ladies large wrist collection and is suitable as an engraved silver bangle. 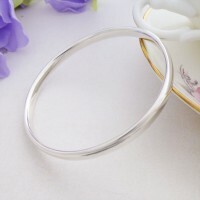 This bangle is exclusively made for Guilty by our silversmith in the UK. 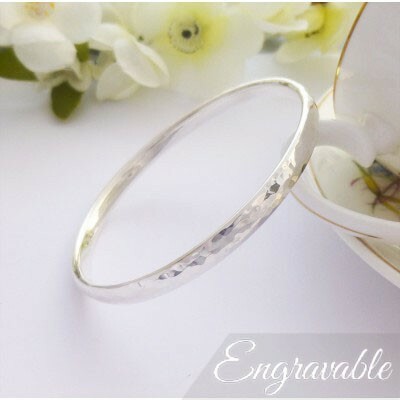 It has a soft, hand hammered exterior and a smooth interior with rounded edges, unique and perfect as a bangle to wear day or night. The Edie large wrist bangle is made from solid 925 sterling silver and has a UK hallmark. 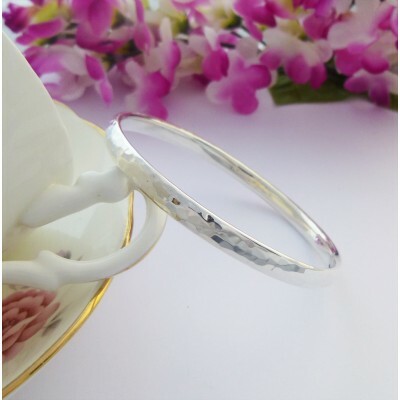 A great bangle if you are looking for a high quality hammered bangle that is solid with a smooth inside and edges. The Edie has an oval cross section that is approximately 6mm wide and 3mm deep, with a 67mm diameter. 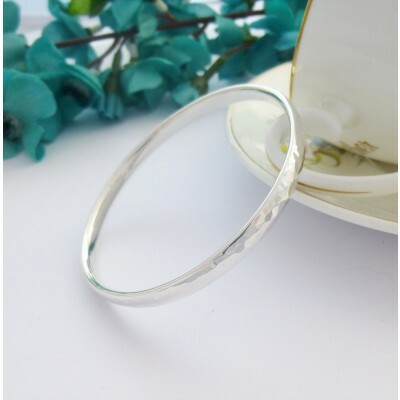 This bangle is suitable for ladies that require a bangle larger than the standard size range, it has an oval cross section that has a highly polished finish with smooth edges providing a comfortable to wear finish. 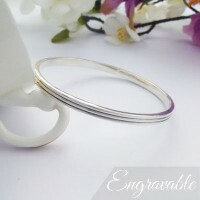 I accept that an engraved bangle cannot be returned unless it is faulty. Are you sure you want to cancel your engraving options? If you cancel, any changes you have made will be lost. The Edie large wrist bangle has an internal diameter of 67mm, perfect for larger sized ladies wrists. The cross section of the Edie large is 6mm wide and 3mm deep. 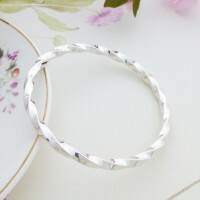 This bangle is solid, handmade in the UK and exclusive to Guilty.